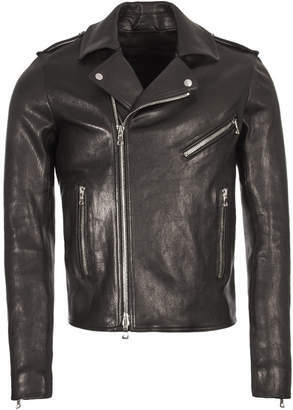 Balmain Leather Jacket in Black. Add some timeless swagger to your wardrobe with Balmain's luxurious take on the classic 'double rider' jacket. Crafted from supple lambskin with premium metal hardware throughout, the jacket boasts an asymmetrical zip fastening, zip adjustable cuffs and epaulette detailing, making this an investment piece that's sure to weather the test of time.